The group is running print and online ads promoting the view that newspapers are very much alive and growing, if you consider the print and online audience together. Newspapers don’t have an audience problem. 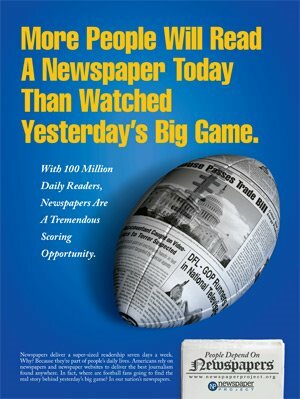 Newspapers have a revenue problem, driven primarily by the recession. That first assertion is debatable. All traditional news media have an audience problem, don’t they? And the revenue problem isn’t just driven by the economy. A shrinking audience (and yes, the audience IS shrinking) means you can’t charge advertisers as much as you could when their ads reached more people. While it’s true that the overall audience for newspapers on the Web grew last year, that may be due in part to the extraordinary level of interest in the US election. And despite the online audience growth, revenues were actually down, according to MediaPost. I do applaud another newspaper initiative that caught my eye today: the executive editor of the Tacoma News-Tribune, Karen Peterson, is trying to publicly shame Seattle broadcasters into giving credit for stories lifted from the paper. We think it’s important for two reasons: First, you should know where your news is coming from so you can judge its credibility; and second, it’s a professional courtesy to give credit where credit is due. Absolutely right. TV newsrooms have much smaller staffs than newspapers, so they can’t cover every story the paper does. But that doesn’t mean they should feel free to lift stories from the paper and use them without attribution. That’s stealing, and it needs to stop. As someone who currently writes for a community newspaper, I have mixed feelings on this initiative. After all, it’s not just newspapers that have a so-called “audience problem”, it’s all old media. I have to wonder if desperation or something else is driving this campaign. Agree or disagree?